Safety Score: 2,6 of 5.0 based on data from 9 authorites. Meaning we advice caution when travelling to Ecuador. Ecuador with its capital Quito is located in South America (Western South America, bordering the Pacific Ocean at the Equator). It covers some 283,562 square kilometers (slightly smaller than Nevada) with 16,290,900 citizens. Spanish is the official language used in Ecuador. As an interesting fact, is sharing borders with Colombia and Peru. Ecuador is a country in South America with a Pacific Ocean coastline and the world's highest active volcano (Cotopaxi). Intercity buses travel to almost everywhere in Ecuador. Many cities have a central bus terminal, known as the terminal terrestre. Quito is a great place to learn Spanish. Quite a few private Spanish academies exist. Quality varies greatly, so check reviews online and speak to current students before enrolling. Ecuador uses the U.S. dollar as its currency. Other types of currency are not readily accepted. Water from the tap is unsafe to drink. Even Ecuadorians generally only drink bottled (or boiled) water. Ecuador offers great opportunities for hiking and climbing, unfortunately, some travelers have been attacked and robbed in remote sections of well known climbs. Travelers are urged to avoid solo hikes and to go in a large group for safety reasons. You can always ask tourist police officers, police officers or in Tourist information center for the dangerous regions. Outside the major cities and tourist areas, malaria can be a problem along the coast during the rainy season. The topography is coastal plain (costa), inter-Andean central highlands (sierra), and flat to rolling eastern jungle (oriente). The average density of population is about 57 per km². The climate in Ecuador can be described as tropical along coast, becoming cooler inland at higher elevations with tropical in Amazonian jungle lowlands. Potential natural disasters are floods, frequent earthquakes, landslides, periodic droughts, volcanic activity and volcanic activity concentrated along the Andes Mountains; Sangay (5,230 m), which erupted in 2010, is mainland Ecuador's most active volcano; other historically active volcanoes in the Andes include Antisana, Cayambe, Chacana, Cotopaxi, Guagua Pichincha, . To reach someone Ecuador dial +593 prior to a number. The local cellular networks are operated on 850 MHz, 1900 MHz, 3G, 4G. Websites typically end with the top level domain ".ec". If you want to bring electric appliances (e.g. battery chaarger), keep in min the local 120 V - 60 Hz (plugs: A, B). The sign for the locally used currency Dollar is USD. 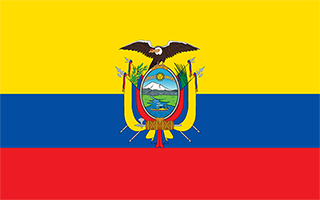 Three horizontal bands of yellow (top, double width), blue, and red with the coat of arms superimposed at the center of the flag; the flag retains the three main colors of the banner of Gran Colombia, the South American republic that broke up in 1830; the yellow color represents sunshine, grain, and mineral wealth, blue the sky, sea, and rivers, and red the blood of patriots spilled in the struggle for freedom and justice.